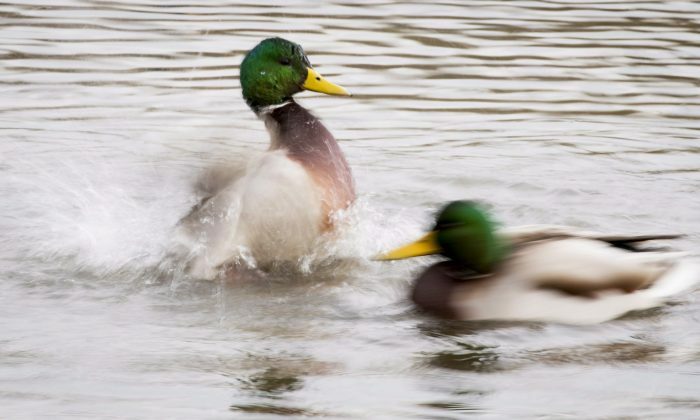 BURNABY, B.C.—A rare duck native to East Asia is making a splash in a lake east of Vancouver and experts believe he is an escaped pet. The Mandarin duck, with his vibrant golden, green and blue plumage, is attracting visitors to Burnaby Lake and was first seen in May, says Irene Lau, chair of the Burnaby Lake Park Association. A similar fowl in New York has drawn crowds too. Lau saw the male duck in the park in late September. This is not the first time that a Mandarin duck has been seen in this park, she says. Records show that about 10 years ago there was a sighting of a Mandarin duck in the area, Lau says, although she adds that there is only that one record. The Mandarin duck is a distant cousin of wood ducks, which have been calling the park home since they were first sighted in the 1960s, she says. In the 1970s the park association started putting up nesting boxes for them, so the wood ducks began to spend winters at the lake. These birds not only glide on water and walk through the grass but they often sit in trees, Lau says. Harold Eyster, a Ph.D. student studying biodiversity and nature conservation at the University of British Columbia, says it seems likely that this bird is an escapee, since these birds are popular garden ornaments. There’s likely nothing on the books that says you can’t keep Mandarin ducks as pets, says the BC SPCA in a statement. Geoff LeBaron, director of the Christmas bird count at the National Audubon Society, says the ducks are a very popular bird with people who raise water fowl, so this bird could be an escaped pet. There was a bit of a flurry of Mandarin ducks being seen in the area for a number of years in the 1980s and 1990s, he says, which possibly came from breeders. Mandarin ducks can breed with the wood duck and create hybrids, LeBaron says. In the wild, they live up to five to seven years. “It could be there quite a while,” he says. Lau believes the duck escaped from a hobby farm, and says people at the park have mostly left him alone. The park also has a bobcat family and a mink so whether he dodges them depends on how smart he is, she says. “But he could stay year-round because life at the lake is pretty good,” Lau adds with a chuckle.